In sales, networking never goes out of style. But are you getting the most from your efforts? In this interview I talk with Ryann Dowdy, Director of Sales at iFocus Marketing about the best approaches to achieving sales success through networking. These are the topics that Ryann and I discussed. Why networking is so important. In sales, and in career development. The key to success in networking. Hint: it isn’t running around throwing out business cards! Find out if networking with women is different than networking with men. Tips for putting your own networking group together, if your community doesn’t have what you’re looking for. Ways to utilize LinkedIn to build your network. The best way to connect with someone you don’t know, but want to connect with? Ryann Dowdy is the Director of Sales at iFocus Marketing, a digital marketing agency in Overland Park, Kansas – part of the Kansas City metropolitan area. Ryann’s career has progressed from an individual contributor to sales trainer and coach, to sales leader. She’s passionate about developing sales talent and coaching her sales team by both in-field and in-office/class room coaching. Her experience as a sales rep turned leader helps her advocate for her team internally and position her reps to win! Ryann believes that building your own network is the key to sales success and long-term career development. When did it all become so personal? When did common courtesy fly right out the window? A colleague of mine posted a LinkedIn video sharing his thoughts on why using LinkedIn to cold pitch was not an effective selling strategy. I happen to agree. A few weeks ago, I wrote about the same topic and the majority of the 65 LinkedIn commenters agreed with my belief that to invite someone to connect and then immediately pounce on them with a sales pitch once they accept is not welcome. Yes, there were salespeople who didn’t agree with my point of view. That’s okay. To their way of thinking, that is exactly how you use the LinkedIn platform. There were similar comments on my friend’s post too. One gal commented that she is passionate about the products she sells and will pitch to anyone with a willing ear. But that’s exactly the point. When someone agrees to your connection request they are not indicating that they are interested in your pitch. In other words, connecting does not equal a willing ear. I’ve written before that ultimately everyone needs to choose what works for them. If the cold pitch is working for you, fine. I don’t believe that it is working for you but I’m not going to argue about it. You will only dig your heels in deeper. But do be aware that in numerous research studies buyers say that they do not appreciate your self-serving sales pitch, regardless how “passionate” you are about your products. You are still making it about you. Choosing to ignore what buyers have said they don’t like about certain selling approaches comes with risk. If you refuse to adapt your selling style in the face of hard evidence that confirms you should, you just make your job harder. I noticed that unlike the comments on my LinkedIn post, which were civil and professional even if the person disagreed with me, many comments on my colleague’s post, especially from one guy, were very personal attacks. Everything from criticizing how my friend dressed, the way in which he presented his message, that he goes by his last name only, and even criticizing the fact that he filmed his post from his mountain house. Seriously? Disagreeing with someone’s point of view on an issue is one thing. Making it personal is another. The grand irony here is that the very people making their comments personal attacks versus adding value to the overall discussion have shown themselves to be about as unprofessional as you can get. I mean, you do realize that we see your name and picture attached to your comment, right? What if I was a potential customer for what you sell and I read your comments? Do you think I’d give you the time of day after seeing how you behave? Do you honestly think that any buyer would? Trust me, my colleague is a big boy and handles himself just fine. Unlike the trolls, he responded to the critical comments with grace. He refuses to conform to what other people deem as professional. He has chosen his own path and by his own admission chooses to be himself even if others don’t agree. I have always admired that about him. I haven’t always been that gutsy. And for the record, he is darn successful, so there’s that! Your brand is your bond. What you say and do online and offline frames a powerful message about who you are as a person and as a professional. Before you decide to troll someone in a public forum for all to see, you might do well to remember that being an A-hole is not a good look. It certainly won’t help win you any sales! In this episode, I talked with Leslie Grossman, author of the book Link Out: How to Turn Your Network into a Chain of Lasting Connections. So, I was curious. We all know LinkedIn but I started by asking Leslie what she meant by Link Out. When it comes to trust, the most effective ways to build trust with a customer or client. How many people find typical networking ineffective in making sales, yet they force themselves to do it. Leslie tells me why she thinks that happens. The most important communication skill you need to master to be successful in sales. You will also learn how to build your own entourage, which Leslie delivered a TEDx talk about. Finally, I closed by asking Leslie to share her advice to women looking to move into leadership roles. Leslie Grossman is an award-winning entrepreneur who advises, trains and speaks on business development, leadership, and marketing, Her most recent book Link Out: How To Turn Your Network into a Chain of Lasting Connectors (Wiley) puts a spotlight on building trusted relationships to achieve your goals. She is the founder of Leslie Grossman Leadership and speaks throughout the world about how trusted relationships transform your business and career. After leading a marketing agency for 12 years, Leslie created the Women’s Leadership Exchange, the first national conference series to propel the businesses of women business owners and professionals reaching more than 65,000 women through more than 100 live events and online programs. Leslie is an executive coach and Chair for Vistage International, the largest peer advisory board organization in the world. She is on the adjunct faculty for The George Washington University Center for Excellence in Public Leadership and coaches entrepreneurs and women executives to break-through to the top by building relationships and transforming habits that dilute their leadership potential. Grossman’s previous book SELLsation! How Companies Can Capture Today’s Hottest Market: Women Business Owners and Executives made her a popular speaker on business development for companies like Aetna, Axa, NorthWestern Mutual, IBM, Best Buy, American Express, and IKEA. How Lindsay’s international experience has been of value to her working for Microsoft and how she leverages experience that in her career. HubSpot CRM makes it easy to organize, track, and grow your pipeline. And it’s free. Forever! You should give it a try right NOW! Convincing people to buy from you is sort of like fishing. To catch those fish you need a product or service that someone else needs, a process you work consistently, a hook with the right kind of bait, patience and great timing. When it gets right down to it, your ability to attract clients and close sales is not that much different. If you stop and think about it for a minute, it’s pretty obvious that Mr. or Ms. Fish isn’t likely to swim right up to you and jump on that hook the moment you throw it in the water. Why then would you expect your potential client to pry open their wallet the moment you throw something at them? Call me old fashioned, but I do believe that you don’t get a second chance to make a great first impression. The quality of that first interaction, whether it is email, the phone or a social media conversation, matters. Though I am a huge proponent of using social media as part of your sales game plan, I also don’t believe that email and email marketing is going away any time soon. To stand out, your message must be relevant to the person you are sending it too. Most sales messages (AKA sales spam) that I see or receive are overly “me” centric. It’s all about the company, the product or that last infusion of cash they received from a major investor. These messages are focused on your sales agenda when it should focus on the buyers agenda. If you don’t communicate your message from the buyers point of view, you lose. Buyers want answers to their business problems. If you can show them that you solve those problems, you have a shot at a customer for life. But a word of caution… when I say, “show them how you solve their problem”, I do not mean rolling into your pitch and demo. Your potential customers do not care about the process of how you get things done. Nor do they really care about the technical details, at least not at the beginning of their decision making journey. Of course, at some point the technical details, or the process of how you get things done will matter, but that isn’t what you lead with in your early stage sales conversations. What buyers care about is the actual RESULT they receive when they buy from you. Demonstrate that you’ve done your homework, understand their business and the competitive challenges they are likely facing. Show them how, working together, you not only are positioned to help solve business problems, but that you can help them create an adoption roadmap that will ensure the success of their purchase and deliver the return on their investment. In more ways than one. Whether you know it or not, the random, pitchy emails you are sending are either uplifting your brand or slowly killing it over time. If expanded networks (with the right targeted buyer) and more leads in the pipeline is the goal, now would be a good time to do a complete overhaul of the sales message strategy you are using. Forget the process and all the jargon. Talk about the problems you solve and the tangible results you deliver. That’s how you turn blah blah blah into BLING! Using social media as part of your sales process is often questioned. Sales management, in particular, want to know if there is a return-on-investment if their salespeople use social for selling. In our Social Media and Sales Quota report, our research did clearly show that sellers who use social media as an integrated part of their selling activities did close deals. This infographic shares the highlights. If you want a copy of the full report, sign up to receive our eNews (in the right hand sidebar) and you’ll be able to download the report immediately. A seller’s most important asset is her network. Prior to the internet and social networks, we cultivated our networks slowly, over time. Salespeople certainly had larger than average networks, since knowing a lot of people opened more doors, which led to more deals, but unless you were a super connector, your network would mostly be comprised of people in your local geography. Typically where you lived and the sales territory you supported were often one and same. The introduction of business networking sites like LinkedIn blew all that up. Now our networks span the globe. Think “pen pal” on steroids. Using Skype, it is not uncommon for me to talk to four or five people each week who live outside the United States. As an example, last week I talked to people in London, Sweden, Germany, Belgium and Israel. The ability to be globally connected also presents us with unique opportunities to team up with others to conduct business. I personally think that’s incredibly cool. Early in the history of social media’s evolution, it was not uncommon for people to publicly brag about their number of Twitter followers, email subscribers or LinkedIn network connections. I imagine many still do. On the surface, large numbers sound impressive and certainly bolsters the braggart’s ego when people gasp or applaud admiringly. Me? I’m not impressed. • If you find it necessary to blatantly self-promote at every opportunity, I have to wonder why. • Numbers on their own do not drive ROI – Return on Influence, Impact and Investment. When I was writing The New Handshake: Sales Meet Social Media in 2009, I believed then, as I have my entire career that it is the mashup of quality plus quantity that matters. Collecting numbers is not the same as developing the interpersonal relationships that lead to the influence you need to be a successful seller. Yeah, I’m sure I’ll get some flak on this one, but it is my opinion based on my own experience. Number collectors are why I’ve never been a fan of the LinkedIn LION (LinkedIn Open Networker) concept. These folks will connect with anyone that breathes. With rare exception, there is only one reason they do it. They want bragging rights. Let’s set aside LinkedIn’s policy for a moment, which says that you connect only with people you actually know, how can you have a relationship with 20,000 individual or more people? Call me a cynic, but my answer is that you can’t. Words are words and numbers are numbers. When I think about the ROI of selling, I think a lot about whether or not I’m having a positive impact that influences someone in a good way. Having a large number of connections or followers, does not necessarily make anyone influential. It is easy to talk about “paying it forward” or “giving first”, but in the end, it is the action behind the words and numbers that tell the real story. The question is are you able to discern the difference? LinkedIn Taking a Cue from Twitter? Interesting that LinkedIn is becoming more Twitter like every day. They are now rolling out the Mentions feature, which is a nifty way to engage people in viewing and contributing their comments to your updates. Think @barbaragiamanco on Twitter and now you can do something similar on LinkedIn. The feature also lets you mention companies and when you do your message is then linked to their LinkedIn company page from your update or comment. Go to your homepage share box to post your update or click “comment” on someone else’s update. Type “@” and then begin typing a name in the box. You’ll then see a list of potential people or companies you can mention. After you select someone from the list and finish your update, that person will receive an email that lets them know that you’ve mentioned them. The name will also be linked to a profile or Company Page from your update. Maria mentioned me in her Status Update, and I received an email notification. Not only is it clear she is giving me visibility with her network of connections, but I have the opportunity to respond and thank her for doing so. LinkedIn has certainly progressed since back in the day. As one of the first 1 million members using LinkedIn – number 874,098 to be exact, much has changed. In case you weren’t aware of it, LinkedIn celebrated its 10th anniversary on Cinco de Mayo (that’s May 5 for you gringo’s). In 10 years’ time, I’ve seen the platform evolve into a powerhouse sales tool. From the beginning, I believed that if LinkedIn could help someone secure that next career gig by harnessing the power of their LinkedIn network, it seemed obvious that the same principle would apply to sales. 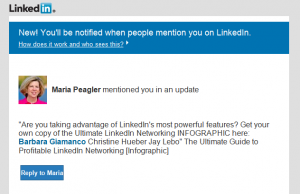 Check out the new Mentions feature and keep me posted on how it is improving the engagement in your LinkedIn network. And remember that this feature is just the next in a wave of more to come. In an upcoming post, I’ll write about what’s coming with Contacts. You will be wowed! P.S. Ask me how I know my LinkedIn member number. Do you know yours? As long as I’ve got the subject of time on the brain, I thought I’d write a post about the biggest objection that I hear from salespeople with respect to using social media as part of their sales routine. That always gets me a little riled, because it says to me three things. One, they haven’t accepted that social media is as critical to their sales business, as email and smart phones have become. Two, these reps still believe that running around to lots of networking events is what gets them the greatest return on their effort even though, at most of those events, their buyer isn’t even in the room. Three, they don’t understand how to use technology to their advantage. Adapt or fall further behind. Whether you like it or not, buyer behavior has changed. Your sales approach needs to change too. Buyers do a significant amount of research online before ever engaging with a salesperson. Can they find you? And, if they do find you, is the information that you’ve shared on your LinkedIn profile (as an example) compelling enough for them to want to talk to you at all? I know, I know. You never thought we’d do business over email either. Well, you were wrong. You are wrong about social media too! Every day business is being transacted over social sites. Unless you want your competitors to step up and kick your bootie, it’s time to move. Ok, so let’s talk about those networking events. When is the last time you carefully evaluated if the events that you are attending is netting you any sort of sales return? In general, you can choose to attend events for two reasons. One, you want the education, because you think the speaker is going to be awesome. Two, you are going to make connections with people who can buy your products and services. Let’s hope that most of you are using your networking time focused on #2. But here’s the problem. Buyers aren’t spending time at networking events like they used to. A friend of mine – he’s the decision maker for the technology providers who get in at his company – tells me that not only does he not spend much time at networking events anymore, he also doesn’t carry business cards to the ones he does attend. Buyers aren’t showing up, because they are tired of being pitched by sellers. Why are you spending so much time there? Free up some time by cutting out events you know aren’t getting you connected to sales opportunities. Spread that time throughout the week and use it to share content, post updates, research your target list of prospects, etc. using LinkedIn, Focus, InsideView, Facebook, Twitter, blogs, whatever. You can create some serious opportunities working social just 30-minutes a day. I know, because I do it. The key is to have a plan and know exactly what you want to accomplish. Finally, use technology to your advantage. Unless you enjoy posting on LinkedIn, then jumping over to Twitter or your Facebook page, use Hootsuite as your social media dashboard and content organizer. Hootsuite’s free version lets you connect to five social media sites and/or RSS feeds. Got a blog you like to follow? Curate the content by setting up the blog RSS feed in your Hootsuite account. Every time a new post is published, a message shoots out from your account to your various social media sites. 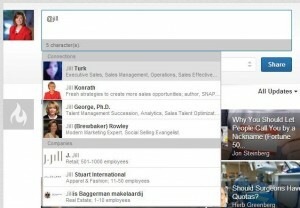 From your Hootsuite dashboard, you can send messages to LinkedIn, Twitter, Facebook, etc. and you can monitor the conversations from there as well. And, you have the ability to schedule messages in advance. You do have time to integrate social media into your sales activities and like any change to the way that you do things, you have to decide if you will spend time on the activities that actually lead to sales – or not.